Shodai Nekketsu Kōha Kunio-kun (初代 熱血硬派くにおくん, Shodai Nekketsu Kōha Kunio-kun?) is part of the long-running Kunio-kun series of beat 'em ups and sports games. 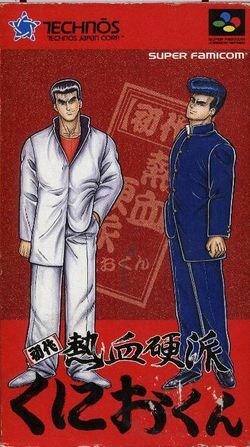 It is the sequel to Nekketsu Kōha Kunio-kun: Bangai Rantō-hen (released outside Japan as Double Dragon II) and was followed in turn by Shin Nekketsu Kōha: Kunio-tachi no Banka. The game was only released in Japan (and only in Japanese); in March 2007 the fan translation team Aeon Genesis fully localised the game into English. The patch is available from this page. This guide is written using the patch, but provides katakana and romaji translations where appropriate. The story opens with a group of students from Nekketsu High School (led by the series' protagonist Kunio) arriving in the city of Osaka. Before long Kunio and his friends discover that not all is well; much like in River City Ransom, gangs of students have decided to take control of the town using their combined strength. While it is sometimes referred to as "River City Ransom 2" the gameplay is significantly different; defeated enemies give experience points rather than money, and only a few items can be purchased by collecting Prepaid Cash Cards from fallen enemies. While the environments are somewhat less restricted the story progression is still linear, and there are also random battles with strangers rather than pre-determined gang members. Once a battle initiates the screen scrolling locks until the battle is over. This page was last edited on 10 February 2010, at 21:08.